This interactive Student Edition contains everything students need to build conceptual understanding, application, and procedural skill and fluency. Opportunities such as vocabulary support, homework pages, digital games, Geometer’s Sketchpad® websketches, real-world problem-solving investigations, and fluency practice, provide meaningful student engagement. Content is organized to address the Standards for Mathematics and emphasize Mathematical Practices. Hands-On activities connect learning to the real world. 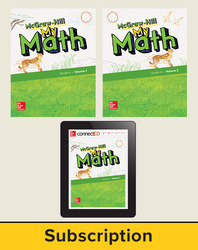 Bundle includes Volume 1 and Volume 2 of the Print Student Edition, as well as access to the online McGraw-Hill My Math Student Center for 1 year.